thewashingmachinepost bike shed is not the most comfortable of places to be, given that it is made of handcrafted wood (who am i kidding? ), and has various bits either rotted away, or missing entirely. however, given the considerable amount of wind and precipitation that comes our way, often joined at the hip, and the fact that it is now twenty years old, discomfort is likely a rather minor complaint. the discomfort refers not necessarily to that which would be encountered if i had to spend a night out in the cold, but to the preponderance of oily, greasy and just plain old dirty bits of chain, brakes, tyres, tools, lubes, greases, sprays and other assortments which have accumulated over those twenty years. it is wise to survey the interior and hatch a plan of strategy if intending to enter and look for some doohicky that went out of compatibility some fifteen years ago, but which might just fit the hole left by a snapped alloy dooflab. competent and confident bycycle mechanics would wear either a remarkably clean shop apron, or for the more wary, a pair of suitably emblazoned overalls. something with campagnolo or cinelli on the back would seem ideal. not wishing to answer to the competence description, i have made it my sole object in life to wear black if there is any chance that i might need to indulge in some bike fettling at any point. this has the desired practical effect of rendering chain oil all but invisible during that brush with a 53 ring, and in normal daily activity i can assume the role of designer chappie without so much as a raised eyebrow; they always wear black. so it follows, even if by tortuous logic, that black is also a particularly apt colour for cycle wear, since entering and leaving the bike shed savours the same problems whether for mechanical reasons or getting out on the bike reasons, a colour solution that seems to invade a large proportion of the winter apparel on offer anyway. a fine coincidence, but one much open to malignment by commuting cyclists and drivers alike, and a complaint not entirely without merit. i'm not convinced by the cyclists' colour theory, because if carried to its logical conclusion, shouldn't the same criteria apply to motor vehicles too? london taxi cabs are black, and spend a good deal of time moving about after sunset, but i can't say i remember anyone suggesting they might like to adopt the more vibrant hue of their new york counterparts. however, irrespective how you view the situation, it cannot be denied that as much illumination on a bicycle after dark as possible is a desirable situation. reflective strips in as many locations as you can think of, flashing rear lights, flashing front lights, and possibly even a bonfire on the rear rack. in this light (pun intended), claqs from two'n'fro are a welcome innovation. 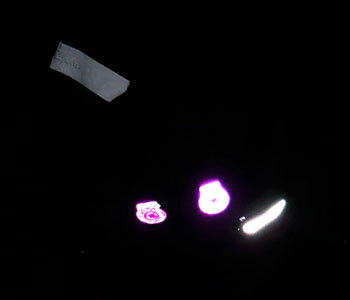 made from a highly reflective plastic material and shaped like (very big) chain links, each circle contains a closed magnet that, when folded in half either over the hem of a jacket, or better still over the top of a rear pocket will demonstrate to car headlights that something is directly in their path. in this case, that something is me. the magnets make it easy to place them wherever you want: one in front, one at the rear, both at the rear; whatever your reflective heart desires. the argument over cyclists in black will continue for many a year yet; meantime here's the ideal way to enhance your current lighting provision and keep yourself safe. two'n'fro claqs are available in pairs from always riding: £5.10 for yellow and white, but mysteriously £9.71 for pink or red. highly durable and highly visible.